Picture the following scenario. It might sound vaguely familiar. You’re a city slicker who stumbles across an online blog detailing the benefits of off-grid living. You’re reticent to read on, but the idea appeals to you. You open a new tab on your browser and find yourself Googling ‘off-grid living’. The options are mind-boggling. You didn’t even know this was possible! Your excitement begins to mount—a life powered by solar panels and rainwater collection systems that support a series of self-contained greenhouses that produce healthy, organic food for you to enjoy year-round! You imagine yourself quitting your job and escaping somewhere deep into the forest, nestled in the perfect tiny home, far away from the evils of the big city where no one but the birds can disturb your environmentally-sustainable dream life! Free at last! Then the proverbial ball drops. What about the toilet? In the tiny home world, we call this ‘flush toilet anxiety’. Rarely does anyone have a problem with off-grid equipment like solar panels or rainwater systems, but when it comes to off-grid toilets, anxiety ensues. I am here to reassure that there is nothing to fear. Off-grid toilet technology has come a long way since it was first invented. There are several excellent, odour-free, easy-to-use options available on the market. In hopes of easing your anxiety, here is a tiny home guide to all things toilet related. Before we talk about off-grid toilet options, let’s review the pros and cons of regular flush toilets. 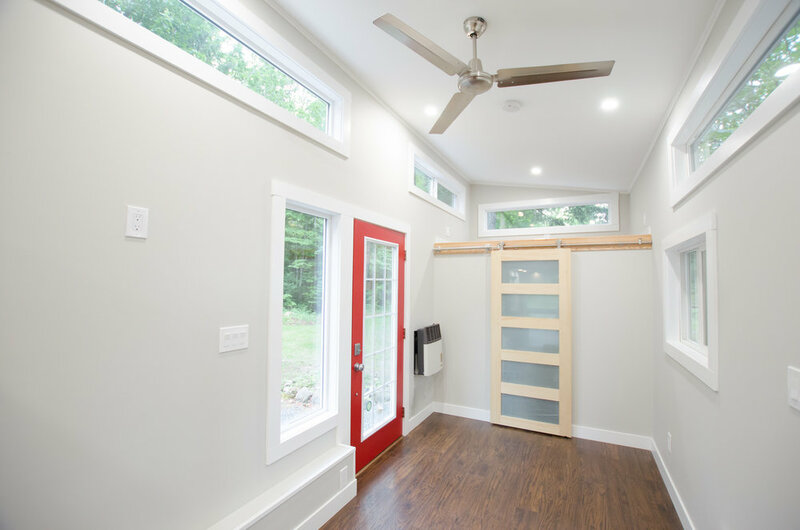 If you have access to a sewer system or septic tank and plan to live in a set location, flush toilets are a feasible option for tiny homes. They are much less expensive than off-grid toilets and relatively simple to install. They come in different shapes, colours and sizes, which gives you more choice when it comes to design. 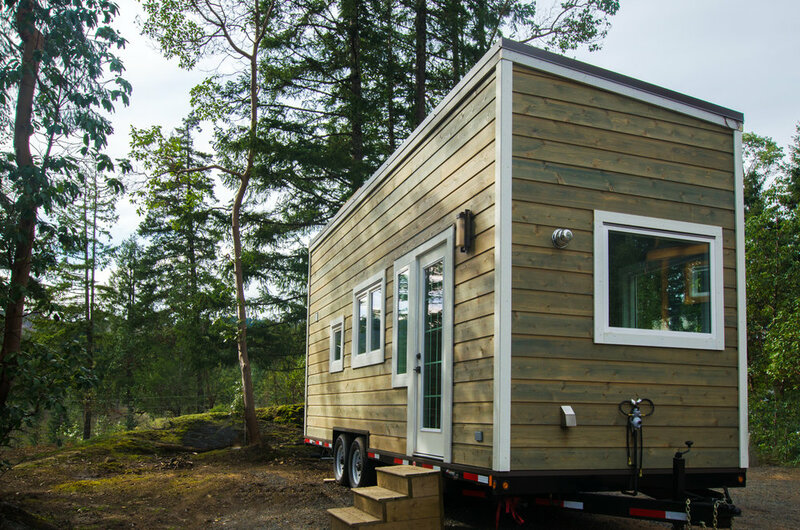 The biggest issue with flush toilets is that they limit where you can take your tiny home. As I already mentioned, flush toilets require a sewer or septic hookup so they’re not particularly useful on the road or for off-grid living. They also waste a lot of water, which costs money and adds to your ecological footprint. Another option is an RV-style toilet with a holding tank, which is arguably a similar experience to using a flush toilet. However, holding tanks require chemicals, and create blackwater, (as opposed to greywater) which needs to be disposed of safely and regularly. They can be quite smelly, and add substantial weight to your home. 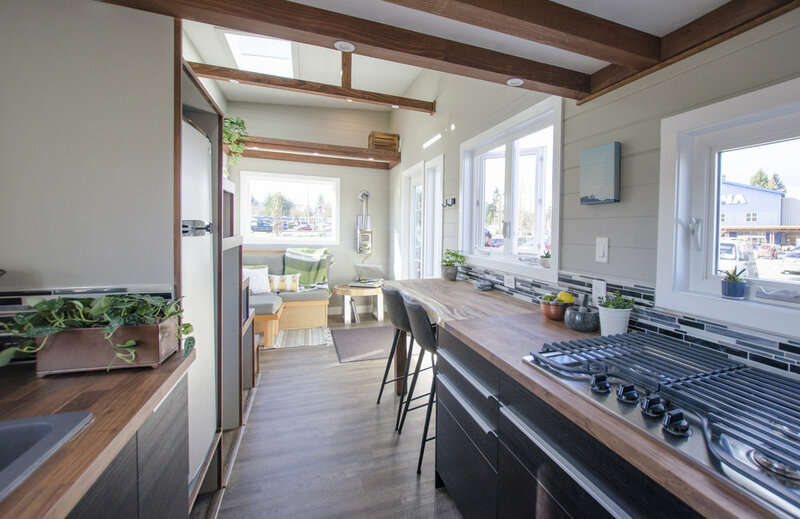 Because of this, RV toilets and holding tanks are not usually a great solution for tiny living—on or off grid. When it comes to off-grid options, there are two main choices: composting toilets and incinerating toilets. Neither require water to operate, and both are suitable for an off-grid living. Composting toilets are more common than incinerating toilets, mostly because they are less expensive and use less power. A composting toilet can cost anywhere between $1000-2000CAD, whereas an incinerating toilet will can cost upward of $6000CAD. Compared to a regular flush toilet, (which you can get on sale for as little as $50), both composting and incinerating toilets are considerable investments. However, over time they can save you money on your water bill, they do not require chemicals or professional maintenance (like a septic or holding tank) and they produce a byproduct that is easily disposed of or composted. But how do they work? Like really. There are several functional differences between models and manufacturers, but in general, composting toilets work by separating solid and liquid waste. We’ve had a lot of success with Separett toilets, as they are easy to install, built to last and our clients love them. A Separett toilet bowl is ‘separett-ed’ into two parts, one that funnels away urine and one that captures solid waste. Because urine is mostly water, and considered sterile, it can be disposed of via a french drain, a tank or diverted to a greywater reuse system. The solid waste drops into a lower chamber, lined with a compostable bag where the waste dehydrates rapidly with the aid of a fan. Because there is virtually no odour, the toilet can be vented through the wall or ceiling. Depending on the amount of people living in your tiny home, the waste chamber only needs to be emptied (taken to the compost) about once a month. One thing to note about composting toilets is that because they use a fan, they do require a small amount of power to run. Separett makes a model called The Villa 9210 which can accept 12V DC power from a battery or solar source, or standard AC power, so that you can live either on or off-grid with your composting toilet. At the push of a button, incinerating toilets literally incinerate solid and liquid waste into sterile ash. They traditionally run on electricity, but more recently, companies like EnviroToilets have engineered models that use natural gas, propane, diesel and even rechargeable solar power. Incinerating toilets draw a lot of power, so if you did opt for solar, you would want to make sure your system was sized to keep your toilet running year-round. We receive a lot of inquiries about both the EcoJohn series by EnviroToilets and Cinderella Motion by Cinderella Eco Group. Ringing in at $4300 CAD, the TinyJohn by EcoJohn is definitely more affordable than the Cinderella Motion, which costs a whopping $6490 CAD. According to Cinderella Eco Group’s website the Cinderella Motion is not yet available in Canada and the USA. Although incinerating toilets offer the potential of mess-free, off-grid living, their lofty price point can be a serious obstacle for the average consumer. For more information on Separett toilets, click here. For more off-grid toilet options head to Tiny Life Supply.